Okay so there's this new product called Olaplex that the hair industry is absolutely freaking out about. It was developed by a few chemists, Dean Christal, Craig Hawker and Eric Pressly. The work these (idk if it's all of them or just a couple, not really sure) chemists are famous for involves helping to stop organs and transplants from being rejected by the body. It is a single molecule that they developed that claims that when added into any haircolor services, will absolutely prevent any breakage, that it links broken bonds in hair back together again. I don't know if this is permanent, or if it's a temporary thing like the PEC complex in the Tresemme Split Remedy line (that basically temporarily binds split ends back together). Of course, I have my EXTREME doubts about this, it seems too good to be true. Dean said "I had a stylist Japanese relax a swatch of hair two times, then 40-volume bleach it, then perm it, and the hair was still in good condition. The control sample that had no Olaplex disintegrated halfway through the test". Olaplex Could (And Will) Change Everything One curious man. Two chemists. One big question. Could you create a product that would never, ever break hair again while haircoloing…even at 40-volume? The Holy Grail of Haircolor It’s called Olaplex, and it just could be the holy grail for haircolor. To never break hair again is a huge claim, so Tracey gave me the guy’s name and number who created the product and the second I got off the line with Tracey, I called him. For the next two hours, Dean Christal spoke to me in a language of chemistry I didn’t understand, with one exception. The part I did comprehend is that the most world famous chemist from the polymer field of chemistry, with countless awards and patents to his name, who has nothing to do with hair, had created a new molecule that would link broken bonds in hair back together again. This molecule, he claims, when added into any haircolor services, will absolutely prevent any breakage. The two-hour chemistry lesson all boiled down to one simple idea—a hair coloist would never have to worry about destroying a client’s hair ever again. One simple molecule. One simple ingredient. Nothing simple about its effects. Imagine never breaking a client’s hair again. Imagine never stripping haircolor again. One Curious Man. Two Curious Chemists. 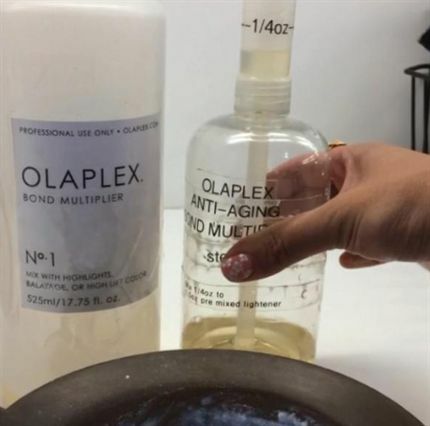 The Olaplex story, in Dean’s words: “I was working with a group of chemists for three years trying to develop a UV activated silicone that would stay in the hair for up to 25 washes. It worked beautifully 80 percent of the time, but 20 percent of the time, various wavelengths in the UVA range made it sticky. An Australian chemist working on the project suggested that I take a shot at meeting Craig Hawker at the Hawker Group at the University of California, Santa Barbara. He said Craig was a chemistry savant and the only one capable of coming up with the solution for our problem. I hung up the phone and immediately drove out to the university and unannounced, walked into Mr. Hawker’s office. We talked for four hours. Almost immediately, Craig came up with an idea for our perplexing UV activated chemistry, and he and I discussed what it would take to create the holy grail of the beauty industry—preventing damage to hair. Craig was intrigued with the idea of repairing hair and preventing chemical damage from occurring. Craig introduced me to Eric Pressly that evening, a PhD in materials, and when I returned the next day at 2 p.m., I was given my first batch of Olaplex. “Craig and Eric were both surprised that the industry had not created something like this,” Dean shared. Thinking From the Outside…In Olaplex has now filled multiple worldwide patents. The work these chemists are famous for involves helping to stop organs and transplants from being rejected by the body. It’s life-saving work. Dean convinced Craig and Eric that helping women feel more beautiful was also life-saving work and just as important. Which it is. And now, the best chemistry from the best minds in medical polymer research has been offered to our industry to solve a problem that’s existed since the development of haircolor. Idk, if this does somehow permanently link the broken bonds back together permanently, and the hair still feel normal and not crunchy/stiff like with that PEC complex BS, then this will change the hair world. It just seems wayyy too good to be true. I mean, what, so you could bleach someone's hair 8 times with 40 vol for an hour each application all in a single day and the hair would still be perfectly healthy? Or bleach already pale yellow hair with 40 vol for an hour in foils under a dryer and the hair would still be fine? Even if it does link the broken bonds back together, they still get broken in the first place, so is it a permanent link or just a bandaid? Despite the rave reviews on it, I am still highly, highly skeptical, it just sounds way too good to be true. What do you all think? Have any of you tried it or know anyone who has? Since this is the second thread about this stuff, I thought I'd look these guys up. Dean Christal is just a guy who makes his money off of patents and, from what I can tell, probably isn't all that familiar with the 'language of chemistry' himself. I'm willing to bet that he's probably funding the project but doesn't work all that closely with the ground-level research. Since there are patents going through now, I doubt that there will be any journal publications anytime soon. Anyhow, Craig Hawker is definitely the guy with a reputation and a ton of well-cited publications and based on the papers I've read coming out of his lab, I have two guesses on how this stuff works. It's a small, organic molecule that similar in structure to your hair's keratin (or maybe not). After a peroxide treatment, it fills in the gaps in your hair and then application of the 'bond multiplier' (probably something to change the pH or maybe sensitizes the molecule to heat/light) assembles all the small, single molecules into a longer chain that get stuck in your hair and won't wash out. It's some sort of silicone-like material that also self-assembles, but coats the hair rather than penetrates it. Anyhow, either way, I'm guessing that it won't make it so your hair can be processed indefinitely, since it relies on the fact that your hair still has enough keratin structure to actually hold in the small molecules. However, it might be able to extend the amount of times you can bleach/dye your hair and maybe reduce the waiting time, since you don't need to wait for the cuticle to tighten back up. In terms of how 'permanent' the process is, it's hard to tell. It's quite possible that it's stable in high pH and is resistant to detergents so that it won't break down with shampoo, but I'd be surprised and impressed if it was also completely UV stable. EDIT: After looking at the bottles more closely, I'm guessing the self-assembly is peroxide-activated, which would make sense since Craig Hawker did a lot of his early work is on polymerization with radicals like peroxide. The second step probably stops the polymerization and/or helps inactivate the peroxide. Oh @vivienne you did all the reading for me thanks! It is very smart, taking advantage of the radicals of peroxide to initiate the polymerization. Do they say what the monomer is? Maybe I can tell you what dissolves the final coating. I've no idea what the monomer is aside from some sort of alkylamine (like any protein unit), and I suspect that it won't be published material on it anytime soon, since it'll probably be a 'trade secret.' I wish cosmetic companies weren't so tight-lipped about their formulas so people could actually figure out what was in them. Looks pretty fishy to me, and the website looks awfully amateurish for a product that is supposed to revolutionize chemical hair styling. Also, I'd be pretty annoyed that someone with knowledge and talents at the caliber of facilitating organ transplants would spend their time on hair products, albeit theoretically amazing ones. It's just been released. Someone needs to try it. Piscine wrote: Looks pretty fishy to me, and the website looks awfully amateurish for a product that is supposed to revolutionize chemical hair styling. Also, I'd be pretty annoyed that someone with knowledge and talents at the caliber of facilitating organ transplants would spend their time on hair products, albeit theoretically amazing ones. So not sure why they claim it is not a silicone? I don't see where they claim it's not though? Hi all, I'm kinda new on here and looking at some of the post's The Olaplex looks good and the professional's seem to be getting excited about it ? There all over it on Facebook. Swilks wrote: I don't see where they claim it's not though? They state it on their Facebook page and sent me an email stating that there were no silicones or oils. I recall some interview somewhere mentioning that the group was originally trying to come up with a UV-reactive silicone treatment to repair hair, but I think they weren't specifically referring to Olaplex. Looking at that patent, it seems like it would require a two-part mixture (a photosensitizer and the siloxane), and some UV treatment would be necessary. It does seem reasonable to me that they could optimize the formula to be peroxide-activated rather than photosensitive, but then, on their Facebook, they constantly talk about how it's only one ingredient. I do recall them offering to provide an MSDS for anyone wanting one, so maybe someone should take them up on that offer. If it just a silicone treatment, it would be pretty disappointing for use with semi-permanents, though, since it would probably make it more difficult for dye molecules to penetrate the cuticle or trap them inside, making them either fade too fast or much too permanent. I'm also a bit frightened by the fact that one person on Facebook mentioned that they tried Olaplex with 50 vol, since her client typically required 40 vol, and the directions with Olaplex apparently suggest a stronger peroxide for best results. Some people are also using insanely long processing times, over an hour. Everyone seems to love it, but I feel like they should use a bit more caution since the formula is unpublished. ". I do recall them offering to provide an MSDS for anyone wanting one, so maybe someone should take them up on that offer." Hi, I hears there's a big waiting list for it and You have to to be a professional colorist to get it . Is that correct ? Giys, just received my first bottle this wek. I am completely blown away. Ordered the travel kit first just to see if it works, and im placing my order for the big one on Monday. Ive tested it on 10 clients this week, and am still in awe. The condition was fantastic afterwards, managed to push the boundaries of their colour so much further. Testing it on myself next week as well. But so far, I am a huge fan. I agree, it definitely is spammy, and quite fishy, as are a lot of the testimonials on the Facebook page. Obviously, I'll be reserving judgment for quite a while, given the lack of very convincing reviews so far. Even if it DOES make the hair feel better than it normally would immediately after, I wonder if it lasts or if it fades out like keratin treatments. Or, if the hair is just permanently stuck with this stuff in it, and if so, what kind of consequences could that lead to down the line...Like if you use it over and over on the same hair, does it just build up on the hair? Like if you used it on the same hair once a month for 5 years, would the hair feel like plastic, or hard, fake like an artificial wig?? I just don't understand how the hair could possibly be repeatedly processed and just never break or suffer in any way, or feel just as healthy and like natural hair (not fake) using it over and over. I would really like to know what effect is on the hair when using it just once, a few times, dozens of times, I want to know what the hair actually feels like if it is permanent and doesn't fade out. And if it does fade out..what, so your hair could just start breaking off because it's not in there any more to hold it together? It really does not seem possible to me that you could just use this 'magical single ingredient' and bleach hair with 40 vol 8 times in a day then perm it and it would never break that day or ever. Saying that you'll never break hair again is a HUGE claim, HUGE. The lack of research studies giving the data on how it effects the hair in the long term makes me really nervous. I can't find anything about that online anyway, unless someone else has a link? As far as I know, we [I]don't[/I] know the effect it has in the longer term, the only thing I've been able to find is random comments/testimonials like on here, their fb page, other hair sites and whatnot, about what the hair feels like immediately after the process. Nothing about what it feels like in a month, a year, 3 years, or if you use it repeatedly..
All these random new member posts seem very spammy to me too, just like the comments on their fb page. The language is all very similar, I wouldn't be surprised if they paid employees to go online and submit rave reviews, just like other businesses do.. I just figured I'd share this video on here. I have no rights to this material. I unexpectedly stumbled upon this video since I liked the resulting colors. They use Olaplex as well as pravana neons in the video. I couldn't say that the Olaplex made a difference since I know stylists often use other methods to hide damage but I thought it was interesting + the resulting colors are amazing. I agree with You, I may be new but I'm not plugging anything. Kayvach wrote: I just figured I'd share this video on here. I have no rights to this material. https://www.youtube.com/watch?v=sdNoNK82Y6s I unexpectedly stumbled upon this video since I liked the resulting colors. They use Olaplex as well as pravana neons in the video. I couldn't say that the Olaplex made a difference since I know stylists often use other methods to hide damage but I thought it was interesting + the resulting colors are amazing. Oh man that blue/neon green is amazeballs and exactly what I wanted this time around...but my lengths are still a little too dark and I was too scared to process again. This stuff definitely intrigues me. I love the results in that video, but is it only me that finds Guy Tang sooooo grating? I hate that he always tells his clients that their hair looks 'ratchet' before, no matter how you pronounce it, or say it as a joke it is so rude imo. Yeah I was thinking that too because I wonder what he would say about my hair...probably that it's super duper ratchet. I think he probably says that because he wants to seem like he is fixing the client's hair so that even if the viewers think it looked better before, he is telling them otherwise. Holy crow that greenish/yellowish one was freakin awesome! Although I agree that guy was a little annoying. Wicked_Pixie wrote: I love the results in that video, but is it only me that finds Guy Tang sooooo grating? I hate that he always tells his clients that their hair looks 'ratchet' before, no matter how you pronounce it, or say it as a joke it is so rude imo. I actually can't stand to watch anything he does now, I just cringe. Like I said before this guy thinks it's alright to leave 20 vol on for hours in order to lift black hair to super blonde. Aye, good one. Swilks wrote: Like I said before this guy thinks it's alright to leave 20 vol on for hours in order to lift black hair to super blonde. Aye, good one. I saw a video where he was advocating 20 vol and 'taking your time' (watching movies?! The girls was in the salon for 5 hours!) but i still think he must have applied the 20 vol bleach more than once to get platinum results on naturally black hair. His videos are cut and edited a lot, i think there is a lot of stuff he chooses to not show. I am sure i have seen him use 50 vol with Olaplex too. I've actually seen quite a few people leave bleach on wayyyy longer than an hour because it takes so long to put the hair into foils. I don't really understand this and why the hair doesn't start breaking off. If somebody has a thick head of hair and it's going to take a long time to put it into foils, why doesn't the hair dresser do half of the hair at a time? I'd like to see anyone using 50 volume with Olaplex. To me that sounds insane lol. I wouldn't believe it if the hair didn't look noticeably damaged. I've used Olaplex many times in the past few weeks. First let me say I used to be somewhat a Guy a Tang fan, but as of late I feel I can't really trust what he says or recommends. Its so obvious that he will say or do whatever is necessary to obtain free goodies from various companies. His "ratchet", brassy before pics are so overly filtered that he lost credibility in my eyes. Now on to Olaplex. Honestly, I don't get all the hype about it. I put it up against Goldwell Silk Lift serum (using silk lift lightener of course), and Silk Lift left the hair in better condition. I purchased the larger Olaplex kit and am just about finished. I won't be purchasing this again. Olaplex claims it let's the stylist "push the envelope" and the box clearly states " never break a clients hair again". By saying if you normally wouldn't do it, don't - you're not pushing the envelope and yes, you can and will still get breakage with Olaplex. Don't have stylists such as Guy Tang - who represent your brand - make claims like their clients hair was so damaged but after olaplex it looked healthier and that he lightened compromised hair with no breakage. Honestly guys, all the after photos you are seeing are styled hair - a decent stylist can make damaged hair look "healthy" with some product and an iron. My verdict is that maybe Olaplex helps a little , but game changer not so much. Goldwell Silk Lift Serum used with SL Lightener is way ahead of the Olaplex game. Actually, I was reading up on the product when I stumbled upon this page. Thought it looked interesting and I could learn something from here, since I am a hairstylist that believes you are never too old to learn something new. If you dont like the product, even without using it, suit yourself. But for hairstylists, its changing everything, and the results speak for itself. Dont be too resistant to change, you might just find someting worthwhile, and not chase "new faces" away from your site, who also just wanted to participate. I have no monetary gain whatsoever from this product, but myself, and my clients can definately see a major difference. @Khair, thanks for your review. It is always good to hear from people who have actually tried the product and are unbiased. Kayvach wrote: I've actually seen quite a few people leave bleach on wayyyy longer than an hour because it takes so long to put the hair into foils. I don't really understand this and why the hair doesn't start breaking off. If somebody has a thick head of hair and it's going to take a long time to put it into foils, why doesn't the hair dresser do half of the hair at a time? Bleach stops processing after about 45-60 minutes, and so long as you are careful not to overlap it onto previously bleached hair, this method is generally okay with 20 vol. I don't always recommend it with 40 vol, because it is stronger and is much more likely to irritate the scalp when left on that long. The term "over processing" refers more to rebleaching already bleached (or permed, or very damaged) hair, versus leaving bleach on too long. As for Olaplex, I am waiting to buy it because I want to see what the overall reviews are. I hope it's awesome, but won't be super surprised if it's not. Hahaha, I don't even have sound on this computer and I'm finding him and the girl annoying to watch! Persevering though as I want to see the final result. Also, just thought I'd mention that this thread is probably getting a lot of newbies because it pops up on the first page of Google search results for Olaplex. There's still not a lot of info out there about it, so I think people might be coming here looking for info/reviews/feedback/etc. urs wrote: Bleach stops processing after about 45-60 minutes, and so long as you are careful not to overlap it onto previously bleached hair, this method is generally okay with 20 vol. I don't always recommend it with 40 vol, because it is stronger and is much more likely to irritate the scalp when left on that long. The term "over processing" refers more to rebleaching already bleached (or permed, or very damaged) hair, versus leaving bleach on too long. As for Olaplex, I am waiting to buy it because I want to see what the overall reviews are. I hope it's awesome, but won't be super surprised if it's not. Ahh I thought it continued to do damage even after it was done processing but I was not aware of this. Edit: Also I thought about this awhile ago and I'm assuming you can use a higher volume with the Olaplex because the total bleach mixture is being diluted. I'm not sure how true that is, just a theory. Yeah, they specifically state in the instructional videos to bump your volume up to the next highest when using it, because it will dilute it. Which is sort of crazy, actually, because I think you only need to use between 1/8th to 1/4th of an ounce. I haven't posted before (or at least not in a very long time), but I'm not really new here either. I lurk. haha. But I've been following Olaplex lately too. A year ago I went from platinum to brunette and I've been wanting to go back to blonde for several months now, but I'm not a big fan of putting bleach over bleach, but from what everyone says about Olaplex, it seems possible to do without really damaging the hair now, so I've got my fingers crossed. Anyway, for those interested, Tracey Cunningham has a video explaining some things about it. In it, she does say that it dilutes the developer and also that it takes a little longer to process. ajosephine wrote: I haven't posted before (or at least not in a very long time), but I'm not really new here either. I lurk. haha. But I've been following Olaplex lately too. A year ago I went from platinum to brunette and I've been wanting to go back to blonde for several months now, but I'm not a big fan of putting bleach over bleach, but from what everyone says about Olaplex, it seems possible to do without really damaging the hair now, so I've got my fingers crossed. Anyway, for those interested, Tracey Cunningham has a video explaining some things about it. In it, she does say that it dilutes the developer and also that it takes a little longer to process. Oh no, the only color remover I would use (Vanish) isn't supposed to be used on hair that has been bleached. Right now, I think the only option I would want to take would be to get some Olaplex and try it out on a test strip to see how it does, and if it damages too much, then I'll just stay brunette a while longer until the bleached parts grow out or can be cut off. The brunette isn't bad, I just miss the blonde. Are you thinking of a color stripper? Removers arent damaging, and are ideal to use on previously bleached hair that has had a darker dye put over it. Color strippers are basically just a weak bleach, usually have a powder that you mix with developer or water. Removers are reductive, typically sulphur based (smelly! Lol) and they shrink the artificial color molecules, then you just rinse them out. They can be drying, so it's important to restore moisture back into the hair after, especially if your hair dries put easily. My hair does and an overnight coconut oil soak with a little olive oil mixed in gets it right back to normal, Or a silicone free moisturizing conditioner. Trying to bleach out dark dye that's been applied to light hair especially rarely results in an even color, you usually get a gradient. Even if this Olaplex stuff does work, I still would always use a remover (not a stripper) first, so that if you do need to bleach, you don't need to bleach as much + you get a more even result. I second Ksiepierski's advice, there is not reason to re-bleach hair that was previously bleached to platinum. You should try a different brand of color remover. I can't imagine bleaching from brunette back to platinum would leave your hair intact even if you used Olaplex. If anyone from olaplex wants to send a sample I'm willing to review it. Kayvach wrote: I second Ksiepierski's advice, there is not reason to re-bleach hair that was previously bleached to platinum. You should try a different brand of color remover. I can't imagine bleaching from brunette back to platinum would leave your hair intact even if you used Olaplex. Oh, I'm not bleaching back to platinum. Just to like a level 9 or so. Platinum was way too light on me. My hair is a faded level 5 right now. ksiepierski wrote: Are you thinking of a color stripper? Removers arent damaging, and are ideal to use on previously bleached hair that has had a darker dye put over it. Color strippers are basically just a weak bleach, usually have a powder that you mix with developer or water. Removers are reductive, typically sulphur based (smelly! Lol) and they shrink the artificial color molecules, then you just rinse them out. They can be drying, so it's important to restore moisture back into the hair after, especially if your hair dries put easily. My hair does and an overnight coconut oil soak with a little olive oil mixed in gets it right back to normal, Or a silicone free moisturizing conditioner. Trying to bleach out dark dye that's been applied to light hair especially rarely results in an even color, you usually get a gradient. Even if this Olaplex stuff does work, I still would always use a remover (not a stripper) first, so that if you do need to bleach, you don't need to bleach as much + you get a more even result. Vanish shrinks the molecules, but it says that it can't be used with bleach. Is there another brand that you know of that works with bleached hair? Right now, probably only the bottom half of my hair is bleached, because it's been a year since my last bleaching and my hair grows quite fast. EDIT: I don't know if it makes a difference, but my hair goes to platinum pretty easily. Bleach with 20 volume developer under heat for 40 minutes with no toner needed, and I'm platinum.... that's virgin hair, though. This topic is locked. Replies are disabled. Anyone tried olaplex? Does it live up to the hype?